Antonio Guterres, asked about UNESCO resolutions, says it is "clear" that Jerusalem is a holy city for three religions. 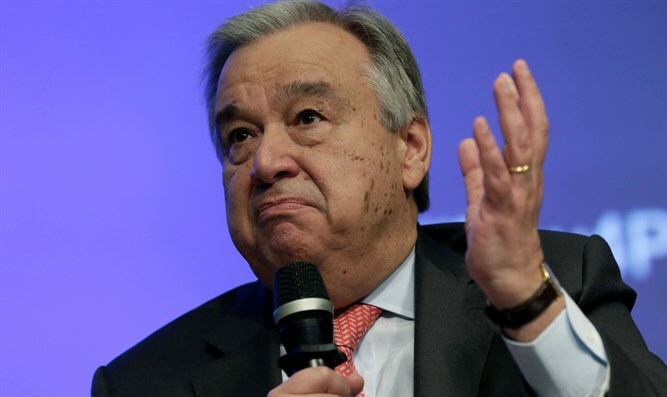 The United Nations is not an anti-Semitic organization and is not interested in the destruction of the State of Israel, UN Secretary-General Antonio Guterres, who is visiting Israel, told Channel 2 News on Monday. He also said that it is “very clear” to him that “Jerusalem is a holy place of three religions and it needs to be respected like that” when asked by the interviewer, Arad Nir, about UNESCO’s recent resolutions denying the Jewish connection to Jerusalem. In Jerusalem, there should be “privilege for Jews for their religion, privilege for Muslims for their religion, privilege for Christians for their religion. To me, they are all equal,” stressed Guterres. Asked about certain member states of the UN that delegitimize Israel, he replied, “Let’s be clear: In the UN you have member states, and member states are responsible for their own policies, and the UN has all the member states in the world. Guterres added that he believes Israel is indeed treated equally by him and the Secretariat he runs. “I’m not blaming anybody [for the lack of progress in the peace process]. I believe it’s necessary to move forward with the political process leading to this two-state solution,” he stressed. On another issue, the UN chief expressed reservations about U.S. President Donald Trump's remarks following the recent violence in Charlottesville. “I think he was not sufficiently aware of how tragic this is. I think he went into a political scene to please part of his electoral or whatever, but this is a matter of fundamental values,” said Guterres.